LG Electronics and LG Display first showed the “Nano Cell,” a new technology based on liquid-crystal display at CES. Since the Nano Cell TV debuted, it was the first time that the panel production line in Paju, Gyeonggi Province, was unveiled to the media. LG said its Nano Cell uses 1-nanometer uniform particles to create subtler, accurate colors that retain their integrity from wider viewing angles -- up to 60 degrees -- than other LCD TVs, including Samsung’s Quantum Dot that uses 2- to 11-nanometer particles. “Red colors on typical LCD TVs can often be polluted by other color wavelengths such as yellow or orange, losing their accuracy,” said Kang Kyoung-jin, a senior researcher. “Nano Cells absorb surplus light wavelengths, resulting in more accurate color reproduction.” Along with reducing potential color degradation issues, Nano Cell also boasts cheaper production costs. A Nano Cell coating is put directly on the mother glass, which requires no extra equipment or change in the overall manufacturing process. 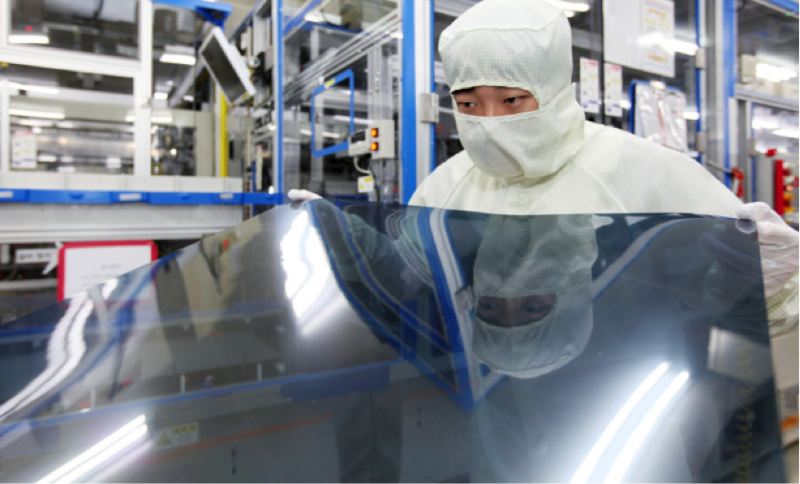 “Due to the cost effectiveness compared to Quantum Dot films, orders are already soaring especially from Chinese TV makers such as Skyworks and Kongga,” the researcher added. LG plans to launch some 30 new TV models this year, with those featuring Nano Cell making up almost half. Despite the overall benefits, LG would not say Nano Cell is an alternative to OLED. “Still, OLED is the most premium model for LG TVs. OLED’s color contrast is of different level from LCD,” said Lee Hee-young, the team leader at product planning. LG is the only panel supplier making OLED TVs and must be careful to establish space between the more expensive OLEDs and the nano cells while still counterbalancing Samsung’s claims that its LCD-based Quantum Dot competes head-on with the OLED. With the two-track strategy, LG has been aiming to expand its presence in the premium TV market. Last year, the company topped $2,500-plus TV sales thanks to high-priced OLED models. In terms of LCD TV sales, LG’s market share remained at 12.8 percent, compared to Samsung’s 21.8 percent. Clearly, pricing is the key to the Nano Cell’s success. The TV sets start at 2.4 million won ($2,100) for the 55-inch model and 4.5 million for the 65-inch model. Samsung has almost doubled prices of Quantum Dot TVs from last year. It costs $3,500 for the curved 55-inch and $4,800 for the curved 65-inch.